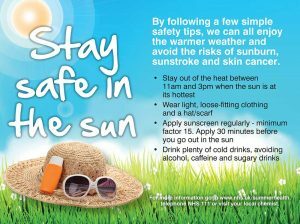 With temperatures continuing to rise in the coming days, make sure you keep yourself, and those around you, safe and well in the sun. 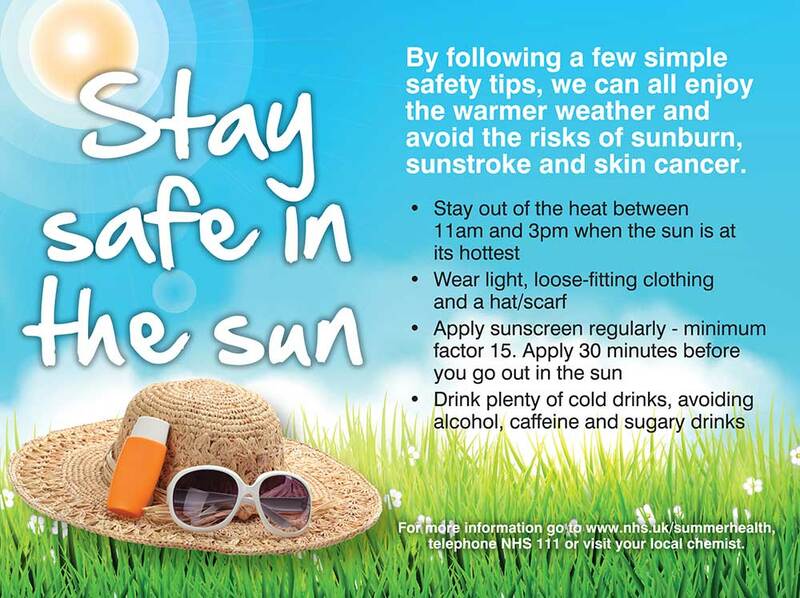 Public Health experts in Knowsley are reminding us that the hot weather can be dangerous for the vulnerable such as the older people, young children and those with serious illnesses. Wear at least Factor 15 sunscreen and remember to apply 30 minutes before you go out in the sun. Reapply every couple of hours. Ensure all children wear a hat or head covering. Ensure children wear light, loose-fitting cotton clothes. Ensure everyone has plenty of cold drinks to keep hydrated (again, avoiding caffeine, alcohol or sugary drinks). It is advisable to eat cold foods, particularly washed salads and fruit with a high water content. Keep the environment cool by keeping windows that are exposed to the sun closed or shaded – electric fans will help too and ensure a flow of air. Ensure there are shaded areas in the play areas. Don’t leave babies and young children alone especially in cars or rooms which get very warm such as conservatories. Monitor children with health conditions. Take extra care when planning outdoor activities such as barbecues, which involve prolonged time spent outdoors as well as posing an additional fire risk. Don’t jump into cold water (dams etc) to cool down. Extreme caution should be taken if entering, playing or swimming in open water. In the meantime, if you are worried about what to do, either for yourself or somebody you know who you think might be at risk, telephone NHS 111 or visit your local chemist.